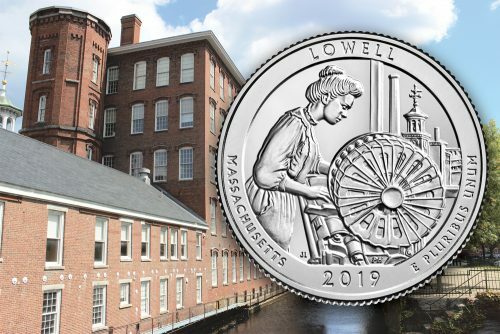 On August 14, 2018, the U.S. Mint announced the final design for the Lowell National Historic Park. The reverse shows a female textile worker at a power loom with its prominent circular bobbin battery. A view of Lowell, including the iconic Boott Mill clock tower, is seen through the window. The inscriptions on the coin’s reverse include the name and location of the site: lowell, massachusetts; the year of issue: 2019, and the motto: e pluribus unum. 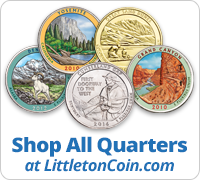 This handsome quarter is a perfect match for the 2000 Statehood quarter, which also featured Massachusetts, the park’s home state. As 46th in the series overall, the Lowell quarter will be followed by a design honoring the American Memorial Park in the Northern Mariana Islands. This entry was posted on January 30, 2019 and filed under 2019, Lowell National Historical Park, Massachussets, with these tags: 2019, American Memorial Park, bobbin battery, Boott Mill clock tower, Lowell National Historical Park, Massachusetts, Northern Mariana Islands, Statehood quarter, U.S. Mint.